The grave of Dolores Ibárruri – a Republican heroine of the Spanish Civil War and the former leader of the Communist Party, known as “La Pasionaria” (the passionflower) – and that of Pablo Iglesias Posse – the founder of the Spanish Socialist Party (PSOE) and of the General Union of Workers (UGT) – have been desecrated in Madrid’s La Almudena civil cemetery. 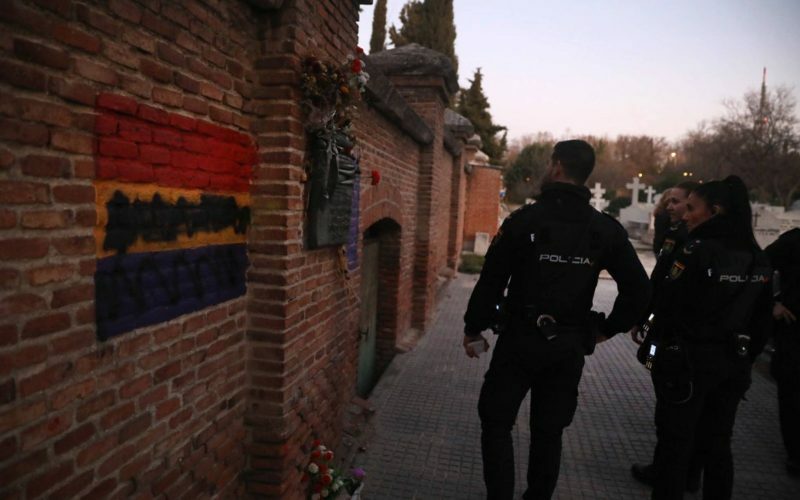 On Monday, Lola Ruiz-Ibárruri, the granddaughter of the former Communist Party leader, discovered white paint on her grandmother’s tombstone and on Iglesias’s crypt. “It is the first time that something like this has happened,” explained Ruiz-Ibárruri, adding that she planned on reporting the acts of vandalism to the police. “I’m hurt, and don’t understand why they’ve done this,” she added. The monument commemorating The Fallen of the Blue Division (Caídos de la División Azul), a unit of Spanish volunteers who served in the German army on the Eastern Front in the Second World War, was also vandalized, according to police sources. It had been painted over with the words “For Spain,” while other scrawls and an anarchist symbol were also found there. The acts of vandalism were not limited to the tombs in the graveyard, which is one of Europe’s largest cemeteries and spans 120 hectares. Two Republican flags on the wall that pays homage to the “Thirteen Roses” had been covered over with black paint. The “Trece Rosas,” as they are known in Spanish, were a group of 13 young women who were part of the Unified Socialist Youth (JSU) group. They were executed by a Francoist firing squad against one of the cemetery’s old walls on August 5, 1939. The execution of these women, the story of which inspired a number of novels, movies, documentaries and songs, was not an isolated event. “More than 3,000 people who fought for democracy and freedom were murdered [against the cemetery walls] between 1939 and 1944,” one of the inscriptions there reads. La Almudena’s cemetery was inaugurated in 1884 despite opposition from the Catholic Church. In addition to Ibárruri and Iglesias, other historical figures belonging to the Spanish left are buried there, including Largo Cabellero, who served as prime minister during the Second Republic from 1936 to 1937, and Julián Besteiro, president of the PSOE and of the UGT during the same time period.